I don’t know about you, but December seems to creep up faster and faster with every year that passes. Although an exciting time of year for many, with festive treats and Christmas cheer, it can also be a little daunting, particularly when it comes to finding the perfect gift for loved ones! 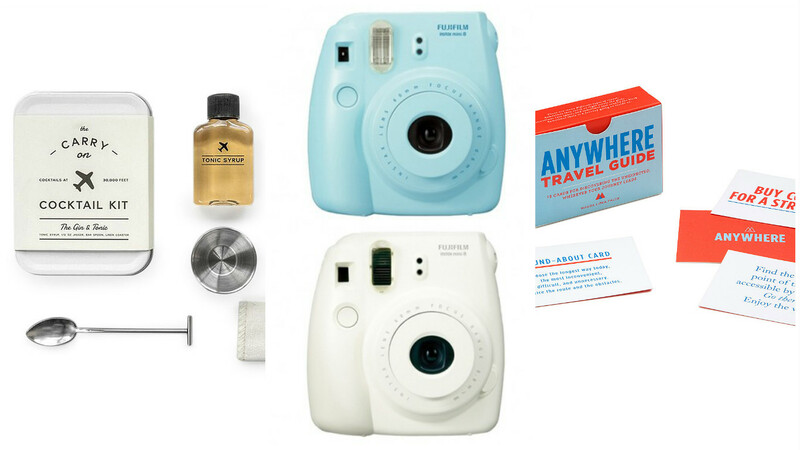 If you’ve left things a little last minute (as I have) and are still on the hunt for gift ideas, I’ve put together a little list of options for the travel loving, avid adventurer, and eager explorer in your life. Know a special someone who is lucky enough to travel often? Or perhaps they have a whirlwind trip coming up? This gift is sure to put a smile on their face and will leave them feeling pretty darn satisfied once they’re back home from their travels and they can scratch away at every place they visited. Seeing it all on paper in front of you is something that’s pretty special! Complete with all your travel essentials with a touch of luxe. 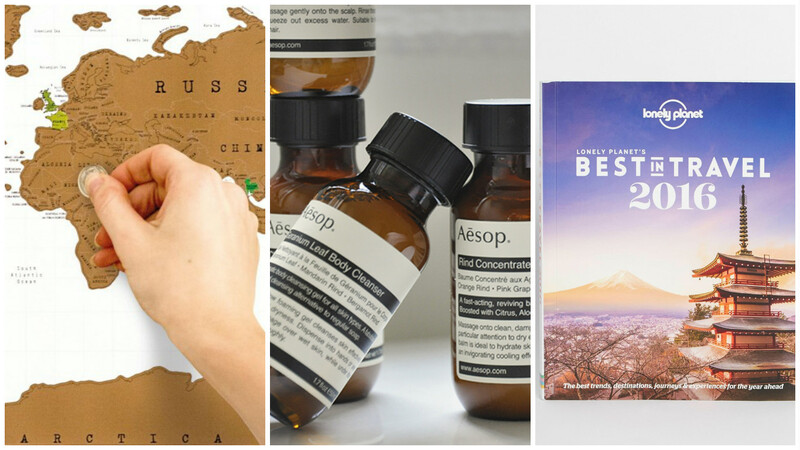 Aesop products really are first class and do wonders for your skin while on the road – after all, sometimes travel can be arduous, no matter how thrilling the destination. After arrival and settling in to their temporary abode, a good cleanse, hydrate and refresh can go a long way. A book FULL of inspiration, information and insights. Lonely Planet are synonymous in the travel industry and are a trusted source for advice and recommendations. With LP’s top 10 countries, regions and cities and over 35 events mapped out month by month, you’re sure to win your travelling pal over with this buy. Perhaps your traveling friend is partial to an inflight cocktail or two? Perhaps they’re setting off with an economy ticket? What better way to help class up their experience than with a gift to see them sipping on their favourite cocktail as the plane sets off! This neat little pack will help them practice their mixology at 30,000 feet. 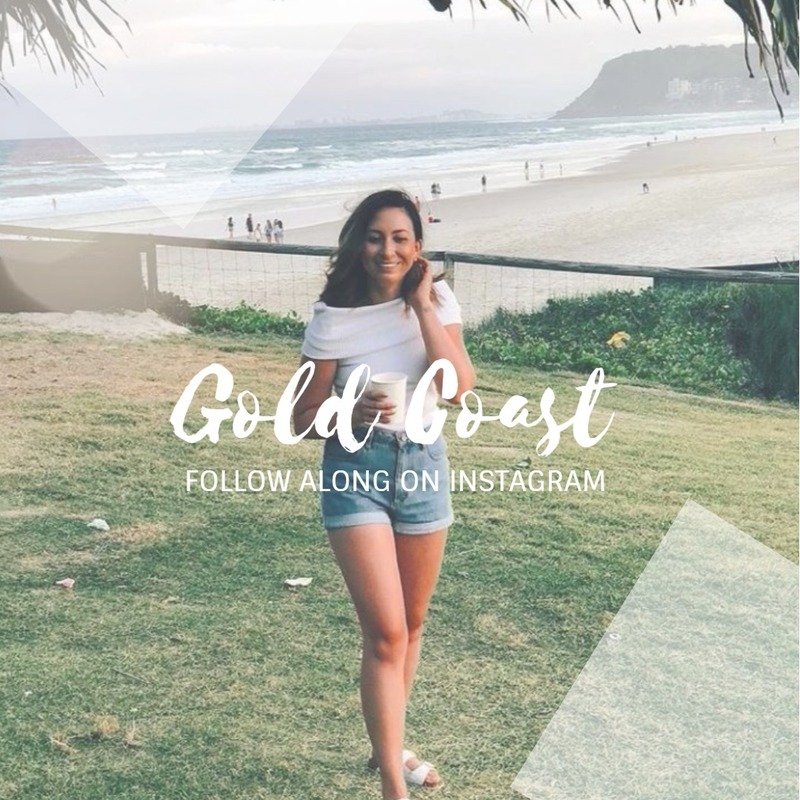 Snap happy and photo obsessed, this is the gift for the friend that likes to have fun with quirky tourist snaps and also loves a good keepsake! These mini polaroid cameras don’t take up much room in your luggage, they look super cute and are a fun novelty when the photos print out (as opposed to sitting online or on your phones camera roll). Certain travel guides can get repetitive: See museums, see buildings, and dine at recommended eateries. But this little pack of guided cards can go anywhere and give you a rather unique way to explore new cities. Great for a traveller who likes to try new things and isn’t afraid to be a little silly. Long haul flights, long bus/train rides and at times questionable accommodation. 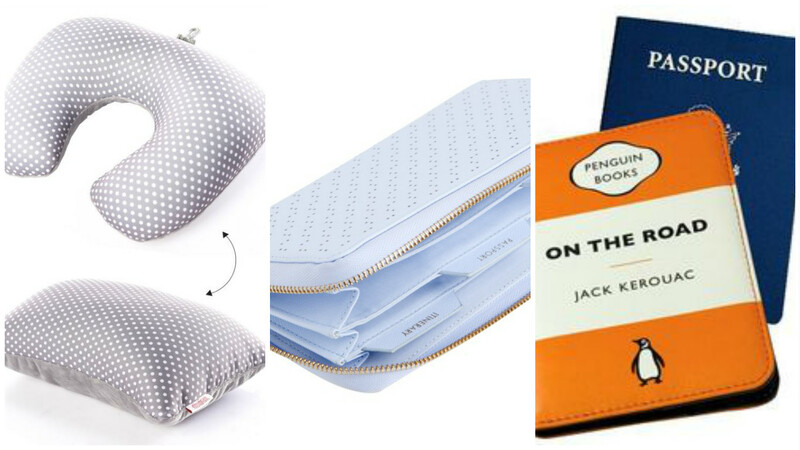 Nothing is more appreciated than having something comfortable to rest your weary head while abroad! This nifty little pillow is a 2 in 1, easily morphing from a comfortable neck hug to a small bed pillow. It also has two different materials on each side – a lovely velvet fleece on one and smooth spandex on the other. The smart hook also allows the U-shape pillow to be attached to carry on bag! For the organised traveller in your life, this gorgeous leather wallet will quickly become a treasured item! Having all of your important travel documents (insurance, reservations, itineraries etc) on hand in the one place makes travelling a breeze! Because passport protection doesn’t have to be boring! Pick out a super sweet passport cover so the pages of their precious passport are covered in style. A tech loving travellers worst nightmare is equipment without a charge! This nifty little charger is bulkier than most, but still fits snuggly into those unused bag compartments such as drink holding pockets. 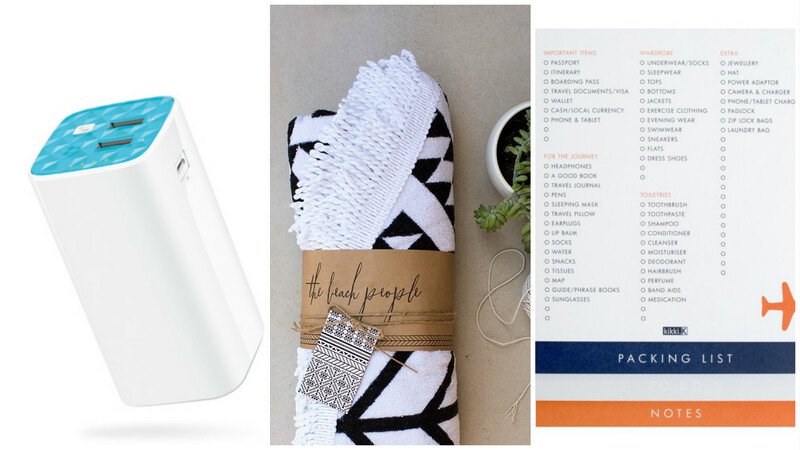 They’ll never be without battery life and will always feel a little connected to home while they’re gallivanting around the globe! For the traveller who continually and unashamedly ventures to the worlds most beautiful beaches. These luxe beach towels almost serve as a must-have fashion piece, with a number of beautiful geometric designs to choose from and a unique round shape! The original ’roundie’, these towels are ‘designed to bring bliss to your sea adventures’. For the trip takers and list makers! This little list is a great stocking filler for the traveller who likes to write it all down and tick it all off. If you’re looking to round out this gift and fill their stocking a little more, check out the other great travel stationery options that Kikki-K have to offer and put together a special pack!